This article is about the Major League Baseball player. For the Australian actor, see Vernon Wells (actor). 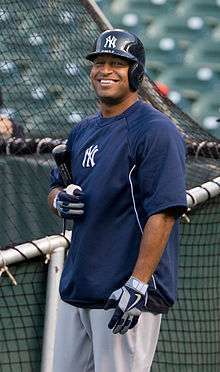 Vernon Michael Wells III (born December 8, 1978) is an American former professional baseball center fielder. He played in Major League Baseball (MLB) for the Toronto Blue Jays, the Los Angeles Angels of Anaheim, and the New York Yankees. Wells has appeared on three All-Star teams in his career, been awarded three Gold Glove Awards, and one Silver Slugger Award. He is second all-time for the Blue Jays in career hits, doubles, runs, RBI and total bases, and fourth in home runs, behind Carlos Delgado, Jose Bautista, and Edwin Encarnacion. Wells was born in Shreveport, Louisiana to Vernon Wells, Jr. and grew up in Arlington, Texas, where his family moved in 1988. His father played in the Canadian Football League and is an accomplished painter. In 1993, Wells entered Arlington's Bowie High School where he played quarterback on the football team and was an outfielder on the baseball team. In his senior year, he batted .565 with 7 home runs and 20 runs batted in (RBI). Before entering the Major League Baseball Draft, Wells signed a letter of intent to attend the University of Texas at Austin to play baseball and football (as a wide receiver). The Toronto Blue Jays made Wells the fifth pick overall in the 1997 amateur draft out of Bowie High School. He spent several years as a top prospect in the Blue Jays organization, starting with the St. Catharines Stompers, Toronto's Class-A team in the short-season New York–Penn League. In 1998, he played for the Hagerstown Suns and was selected as the Utility Outfielder on the South Atlantic League End of Season All-Star Team. In 1999, he played in the Australian Baseball League with the Sydney Storm. From 1999 through 2001, Wells was a regular September call-up and played in 57 major league games. In 2002, Wells was given his first chance to be an everyday player. Although disqualified from Rookie of the Year contention because he had exceeded the 130 career at-bat limit to qualify as a rookie (the award went to teammate Eric Hinske), Wells proved himself to be one of the game's rising stars. He batted .275 with 23 home runs, 100 RBI and 87 runs while becoming one of the best defensive center fielders in the game. In 2003, Wells' finished the season with a .317 batting average, 33 home runs, 117 RBI and 118 runs. He led the league with 215 hits, 49 doubles, and 373 total bases and finished 8th in American League MVP voting. He also participated in his first All-Star game. He won the AL co-player of the week for the first time on June 23, 2003, sharing the honor with Corey Koskie. Wells won his first Gold Glove Award in 2004, and a second in 2005. Wells began the 2006 season on a torrid pace, and continued to hit well throughout the year, ending the season with a .303 batting average, 32 home runs, and 106 runs batted in. Wells' year was capped by a game against the Boston Red Sox in which he hit three home runs, with two coming off of Red Sox starter Josh Beckett. He won the AL player of the week honor on July 24. Wells was selected as a reserve outfielder on the American League All-Star Team and was promoted to the League's starting lineup after an injury to Boston's Manny Ramírez. It was his second appearance in the mid-summer classic. During the season, Blue Jays general manager J.P. Ricciardi criticized Wells, as well as teammates Troy Glaus and Shea Hillenbrand, for failure to perform during key situations after two losses to the Kansas City Royals just before the 2006 All-Star break. He followed such criticisms with great play throughout the rest of the year, including a walk-off home run against New York Yankees closer Mariano Rivera. On September 24, he recorded his 500th RBI in a game against the Boston Red Sox. At the end of the 2006 season, Wells was awarded his third consecutive Gold Glove Award for outfield defense, along with Torii Hunter, and Ichiro Suzuki. He also signed a back-loaded contract for $126 million over seven years. In 2007, Wells suffered a shoulder injury early in the 2007 season and had shoulder surgery in September. On May 8, 2008, Wells suffered a broken left wrist while making a diving catch. He returned on June 7, but later strained his left hamstring on July 9 and missed over a month of the season. 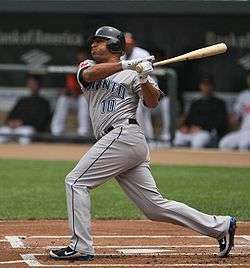 Despite the significant amount of time missed to injury, 2008 otherwise represented a return to form for Wells as he finished the year hitting .300 with 20 home runs and 78 RBIs in just 108 games. During spring training in 2009, Wells suffered another injury, a strained left hamstring which kept him out for several weeks. At the beginning of the season Wells batted fourth in the lineup and was playing center field. He struggled with consistency at the plate, and was subsequently dropped from the fourth spot in the lineup before the All-Star break. Though he stole 17 bases, Wells finished the year with some of the worst numbers of his career, batting .260 with only 15 home runs and 66 RBI and finishing with an OPS near .700. During the season, he received significant criticism from the press regarding his large contract. Wells began 2010 at a promising pace, hitting four home runs with eight RBI in the first series. He continued to play well, hitting .337 with eight home runs and 16 RBI in April. On April 7 he had a multi-home run game against the Rangers, his first since September 28, 2008. On June 27, Wells hit a two-run home run that made Jamie Moyer of the Philadelphia Phillies, Major League Baseball's all-time leader in home runs allowed, with 506. On July 5, 2010, Wells was named a reserve for the 2010 MLB All-Star Game, along with teammates José Bautista and John Buck. Wells was also a participant in the Home Run Derby, when Chris Berman predicted that Wells, whom he nicknamed the "Canadian Breeze", would carry away the title. Wells ended up hitting two home runs in the first round. On September 24, 2010, Wells hit his 30th home run of the season. That home run made Wells only the fourth player in Blue Jays history to have three or more seasons with at least 30 home runs, joining Carlos Delgado, Joe Carter and Fred McGriff. At the end of the season, Wells had 31 home runs, 88 RBI, and an .847 OPS, making the 2010 season his best since he signed his contract extension in 2006. He finished the year batting .273, with 161 hits in 590 at bats, giving him over 1,500 hits in his career. Also in 2010, Wells was selected to receive the Branch Rickey Award for humanitarian works by the Rotary Club of Denver. He is the second member of the Blue Jays to receive this honor; Dave Winfield was the 1992 recipient. The award was presented on November 13, 2010 and Wells was then inducted into the Baseball Humanitarians Hall of Fame. 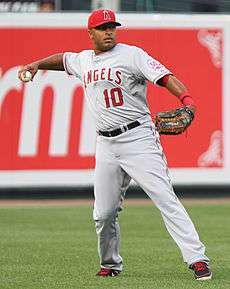 On January 21, 2011, Wells was traded to the Los Angeles Angels of Anaheim, in exchange for catcher Mike Napoli and outfielder Juan Rivera. Angels' owner Arte Moreno insisted on the trade, and reportedly told Tony Reagins, the general manager, that he would be fired if he did not acquire Wells within 24 hours. Wells started out the season hitting below the Mendoza Line through the first month-and-a-half of the 2011 season. At the All-Star break, his batting average improved to .222. Wells "heated up" during the months of June and July, hitting 11 home runs combined in those months, after hitting only four in the previous two. In his first game back in Toronto on August 12, Wells received a standing ovation before his first at bat, and followed that up by taking the first pitch of the at bat thrown by Brandon Morrow over the left-center field fence. In 2011, he batted .218, the lowest batting average of all major league ballplayers with 512 or more plate appearances, and also had the lowest on-base percentage (.248). On March 26, 2013, the Angels traded Wells to the New York Yankees for minor leaguers Exicardo Cayones and Kramer Sneed. The Yankees will pay $13.9 million of the $42 million remaining on his contract. Wells switched to number 12 as number 10 is retired by the Yankees for Phil Rizzuto. On May 8, 2013, Wells played third base for the first time in his career. He then played second base for the first time on May 15. On July 26, Wells changed his uniform number from 12 to 22 to give to Alfonso Soriano, who had been reacquired from the Chicago Cubs. On August 5, 2013, Wells made his first start and appearance at first base. On January 10, 2014, Wells was designated for assignment by the Yankees and later released on January 16. In 130 games for the Yankees, Wells hit .233 with 11 home runs in 2013. Wells currently resides in Westlake, Texas, near his hometown of Arlington, Texas. In 2001, he married his high school sweetheart, Charlene Valenti. He has two sons, ages 11 and 14 as of May 2016. During the 2006 post-season, Wells was an analyst for ESPN's Baseball Tonight show. Beginning in 2002, Wells acted as the Honorary Commissioner of the Toronto Rookie League, a Greater Toronto Area baseball league run for underprivileged children who live in Toronto Community Housing. ↑ "Dirty dozen for Pudge; sixth for Chavez, Hunter, Ichiro". ESPN.com. ↑ "Blue Jays All-Time Leaders". Mlb.mlb.com. Retrieved October 27, 2011. ↑ "The Angels' big offseason acquisition, Vernon Wells, was once a star football player". Mlb.mlb.com. January 26, 2011. Retrieved October 27, 2011. ↑ "Flintoff and Dunn Alamanac". Pflintoff.com. Retrieved October 27, 2011. ↑ "Bautista blasts Nos. 51, 52 as Jays drop O's". Toronto Bluejays. MLB. September 24, 2010. Retrieved October 27, 2011. ↑ "Wells earns 2010 Branch Rickey Award". Mlb.mlb.com. September 15, 2010. Retrieved October 27, 2011. ↑ "Blue Jays trade Vernon Wells to Angels for Mike Napoli and Juan Rivera | bluejays.com: News". Toronto Bluejays. MLB. Retrieved October 27, 2011. ↑ "2011 Regular Season MLB Baseball Batting Statistics and League Leaders". Espn.go.com. Retrieved October 27, 2011. ↑ "Vernon Wells joins Yankees, calls it 'dream come true'". USA Today. 2013-03-26. Retrieved 2013-04-01. ↑ "Report: Yankees designate Wells for Assignment". TSN.ca. January 10, 2014. Retrieved January 10, 2014. ↑ Jon Paul Morosi (15 May 2013). "Yankees continuing winning tradition". Foxsports.com. ↑ "Major League Baseball Players Association: Press Releases". Mlbplayers.mlb.com. Retrieved October 27, 2011. Wikimedia Commons has media related to Vernon Wells.